Spring is in the air!! Well... at least it is here in San Diego. Warm, bright days have me turning to simple bowls for lunch, and often for dinner as well. But no matter the weather, quinoa reigns as one of my go-to ingredients. A protein-filled seed hailing from the Andean regions of Peru, quinoa earns its title of an "ancient grain" (actually it's really a seed, but many use it as a grain) with its near 9,000 year history. Once called "The Gold of the Inca's", quinoa isn't just "high" in protein, it's a complete protein - meaning it contains all 9 essential amino acids. 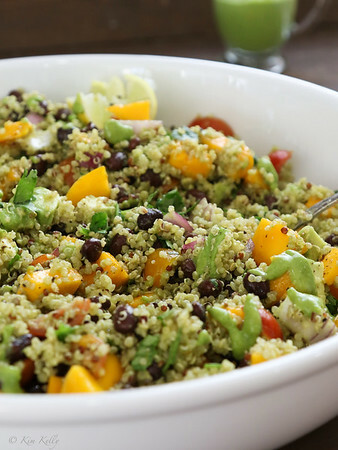 A wonderful protein source for vegans or vegetarians, quinoa also brings magnesium, folate, manganese and phosphorus, making it a nutritious ingredient which also happens to be incredibly versatile. Unfortunately, quinoa also happens to be coated with a naturally occurring coating called "Saponin", a bitter tasting coating which protects the seeds from being eaten in the fields by birds and insects. Many quinoa brands remove most of the saponins in processing, but a good rinse of your quinoa before cooking is always a good idea to remove the last of the residues, or to remove all of the residue if it hasn't been washed already. But washing quinoa is quite possibly my least favorite thing to do. Those tiny seeds slip through many colanders unless you have the finest of mesh, and then pouring the rinsed (and now clumpy) seeds into your pot becomes nearly impossible often dumping as a whole clump only to splash you in the process. And those tiny seeds... how often have they lodged into the rim of that fine mesh strainer? It's all enough to tempt one to leave that quinoa on the shelf. Our Colander has holes designed to allow water to drain slowly to wash impurities and starch from rice, quinoa, buckwheat, barley and more. The water pools before draining to show when water is clear and grains are clean. The small, square holes help prevent tiny grains from falling through, and the extra drain holes in the pour spout remove excess water and keep grains contained. Soft, comfortable, non-slip handles are perfect for agitating grains, shaking out water, and pouring into pots or bowls. OXO sent me this product along with a super cool Grape Tomato Cutter (cuts grapes and tomatoes into quarters with a simple push of the plunger!) 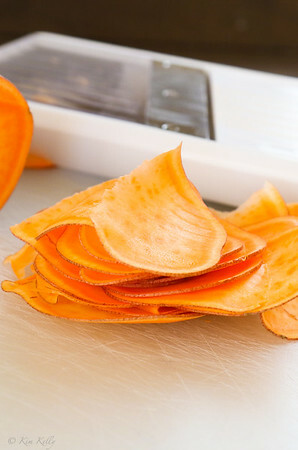 and a beautifully sharp Hand-held Mandoline, and I have to say these products rank up there with the OXO Dusting Wand in my all time favorites category. 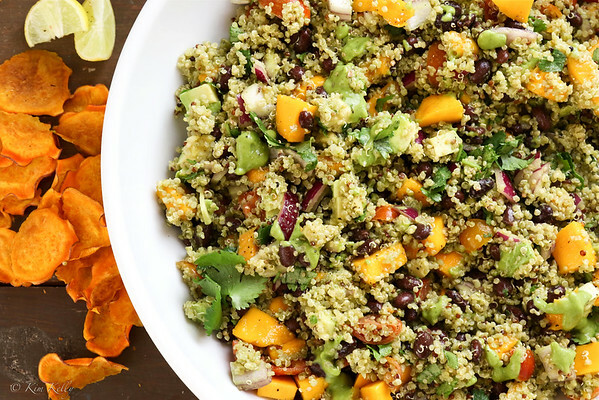 Bringing together some of my favorite quinoa combos, avocado and mango fit perfectly into the picture to create a nutritious quinoa bowl. What goes with avocado? How about adding even more protein with black beans, definitely some kick from red onion, and then seasoning it all with a healthy handful of cilantro? Oh, and tomatoes. A lovely basket of baby cherrys from the farmer's market were already on hand and I had to laugh when Liv actually brought girlfriends home for lunch simply so they could try out the tomato cutter. Let's just say all of our tomatoes are now cut! So how about a bowl of your own? Whether you need to rinse rice, barley, or my beloved quinoa, you won't hesitate now that you have a grain rinsing colander. What's your favorite combo?